We carry a number of different parasols, but this is one designed specifically to go along with our range of different clown costumes. 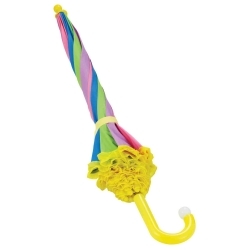 The parasol has a bright colored handle and each panel is colored in a different bright color that is perfect for clowns. The parasol measures 25" in length and opens to a diameter of 34".